The risk of falling increases with age and is greater for women than men. There are many causes for falls such as medication side effects, environmental hazards in the home, poor vision, and decreased muscle strength. Being too sedentary can result in poor muscle tone, decreased strength, and a loss of bone mass. Listed below are tips to lessen your risk of falling. Repair cracks in sidewalks/steps or raised thresholds in doorways. Make sure there are handrails on both sides of steps. Trim shrubs next to walkways. Have adequate lighting in each room and the hallways. Don’t climb stools or ladders. Change the color of the transitions into different rooms and on the steps. Put nonskid pads under rugs so they won’t slide. Use a raised toilet seat and make sure there are grab bars in the bathroom. Use a walker or cane if the doctor advised you to and make sure you are using it properly. Sit on the edge of the bed for a few minutes before standing to avoid dizziness. Make sure you are taking enough calcium and vitamin D.
Make sure you are doing some weight bearing exercises. Weight bearing exercises build bone mass. If you are not sure which exercises to do, Harbor Physical Therapy can instruct you in a home exercise program to help decrease the likelihood of falling. 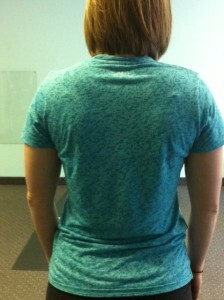 What is good posture and which exercises can I do at the gym to improve my posture? While standing, if you can draw an imaginary straight line through your earlobe, the tip of your shoulder, through your knee, and the middle of your ankle, you have good posture. Standing with good posture usually involves doing a slight chin tuck so your head is over your shoulders, pulling your shoulders back and tucking in your stomach. Good posture lends to less stress on your joints and muscles resulting in less discomfort and risk for injury. At first, maintaining good posture may be tiring. Eventually, you will build up the endurance in your muscles and it will come more naturally. Here are some examples of stretches that you can perform to help achieve good posture. Pectoralis muscle stretch– Just put your hands up on a doorway and gently step through with one foot until you feel a stretch. All stretches should be held between 15-60 seconds. Hamstring stretch– You can sit or stand. 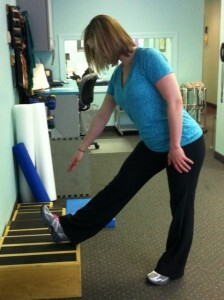 Put one foot up on a step or the coffee table and lean toward your foot. Shoulder blade squeezes– You can just squeeze your shoulder blades together or use an exercise band to row your shoulder blades together. 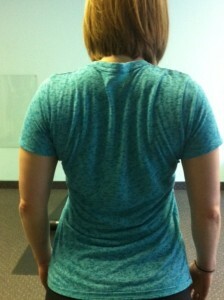 Good posture involves training the body to be in a position that results in less strain on your muscles and joints. If you are looking to improve your posture or decrease your neck/back pain with long-term sitting or standing, make an appointment at Harbor Physical Therapy for an individualized treatment program.